OAKLAND, Calif., April 16, 2019 — Franz Inc., an early innovator in Artificial Intelligence (AI) and leading supplier of Common Lisp (CL) development tools along with Graph Database technology for Knowledge Graphs, today announced that Barefoot Networks uses Franz Allegro CL® (Allegro Common Lisp) in the design of the Barefoot Tofino series programmable switch chips to enable Artificial Intelligence, solve complexity, drive superior performance and power efficiency within networks. OAKLAND, Calif., March 4, 2019 — Franz Inc., an early innovator in Artificial Intelligence (AI) and leading supplier of Semantic Graph Database technology for Knowledge Graphs, today announced AllegroGraph v6.5 , the first multi-model semantic graph database to support the ingestion of JSON and JSON-LD documents, comma separated value (CSV) files and RDF data. AllegroGraph 6.5 makes it possible to automatically link structured RDF data to information within JSON documents based on semantic concepts, allowing users to perform graph analytics across linked data within databases, document stores and CSV files. Traditional document databases have excelled at storing documents at scale, but are not designed for linking data to other documents in the same database or in different databases. AllegroGraph 6.5 delivers the unique power to define many different types of documents that can all point to each other using standards-based semantic linking and allow users to run SPARQL queries, conduct graph searches, execute complex joins and even apply Prolog AI rules directly on a diverse sea of objects. OAKLAND, Calif. January 30, 2019 — Franz Inc. is an innovator in Artificial Intelligence (AI) and leading supplier of Semantic Graph Database technology with expert knowledge in developing and deploying Knowledge Graph solutions. Franz’s Knowledge Graph services combine broad experience, domain expertise, best practices, tools, methodologies, assets and proven delivery methods with a pragmatic approach to planning and design. Franz Inc., an early innovator in Artificial Intelligence (AI) and leading supplier of Semantic Graph Database technology for Knowledge Graphs, today announced that Gartner featured AllegroGraph in a recent report that explains the importance of using semantic technology to drive business value out of data. AllegroGraph is a Semantic Graph Database that enables organizations to gain sophisticated insights and predictive analysis from highly complex, distributed data – exceeding the possibilities of conventional databases and laying the foundation for Knowledge Graphs and Artificial Intelligence solutions. OAKLAND, Calif. — January 7, 2019 — Franz Inc., an early innovator in Artificial Intelligence and leading supplier of Semantic Graph Database technology for Knowledge Graph applications, today announced that it has been named to the Database Trends and Applications – 2019 Trend-Setting Products. “You can call it the new oil, or even the new electricity, but however it is described, it’s clear that data is now recognized as an essential fuel flowing through organizations and enabling never before seen opportunities. However, data cannot simply be collected; it must be handled with care in order to fulfill the promise of faster, smarter decision making. [Oakland, CA November 1, 2018] — Jans Aasman, CEO of Franz Inc. an early innovator in Artificial Intelligence (AI) and leading supplier of Semantic Graph Database technology, AllegroGraph, for Knowledge Graphs, has been accepted into Forbes Technology Council, an invitation-only community for world-class CIOs, CTOs, and technology executives. Dr. Aasman was vetted and selected by a review committee based on the depth and diversity of his experience. Criteria for acceptance include a track record of successfully impacting business growth metrics, as well as personal and professional achievements and honors. 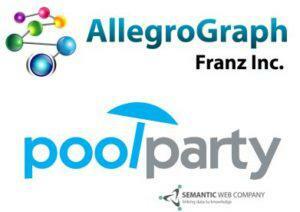 OAKLAND, Calif. and VIENNA, Austria – September 10, 2018— Franz Inc., an early innovator in Artificial Intelligence (AI) and leading supplier of Semantic Graph Database technology, AllegroGraph, for Knowledge Graphs, and Semantic Web Company, developers of the PoolParty Semantic Suite and leading provider of Semantic AI solutions, today announced a partnership to develop the Noam Chomsky Knowledge Graph. This project is the first aimed at connecting all the works from a public figure and turning the linked information into a searchable and retrievable resource for the public. April 20, 2018 – Franz Inc.’s CEO, Dr. Jans Aasman, will present at the Enterprise Data World Conference in San Diego, CA Tuesday, April 24th, 3:30 PM. The 22nd annual Enterprise Data World (EDW) Conference is recognized as the most comprehensive educational conference on data management in the world. Delivering Scalable Knowledge Graph Solutions – Franz Inc.
OAKLAND, Calif. — December 11, 2017 — Franz Inc., an early innovator in Artificial Intelligence and leading supplier of Semantic Graph Database technology for Knowledge Graphs, today announced it has been named to the Trend-Setting Products in Data and Information Management for 2018 by Database Trends and Applications. OAKLAND, Calif. — December 6, 2017 — Franz Inc., an early innovator in Artificial Intelligence and leading supplier of Semantic Graph Database technology – AllegroGraph, today announced that it has been named to The Silicon Review 50 Fastest Growing Tech Companies 2017 – Delivering Scalable Knowledge Graph solutions Franz Inc.
“The Silicon Review 50 Fastest Growing Tech Companies 2017 program identifies companies which are successful bringing more innovations to the IT and Business world than others, and winning a spot on this list indicates the company has distinguished itself from peers by proving itself more valuable in terms of innovation, service quality, vast customer base, and market position,” said Sreshtha Banerjee, Editor-in-Chief of The Silicon Review Magazine. The publication has selected ‘Franz Inc.’ based on its product/service innovation, customer retention health, financial status, and moreover, the ability to predict market trends. AllegroGraph is a database technology that enables businesses to extract sophisticated decision insights and predictive analytics from highly complex, distributed data that cannot be uncovered with conventional databases. Unlike traditional relational databases or other NoSQL databases, AllegroGraph employs semantic graph technologies that process data with contextual and conceptual intelligence. AllegroGraph is able run queries of unprecedented complexity to support predictive analytics that help organizations make more informed, real-time decisions. OAKLAND, Calif. — September 13, 2017 — Franz Inc., an early innovator in Artificial Intelligence and leading supplier of Semantic Graph Database technology – AllegroGraph, today announced that it has been named to the Database Trends and Applications Big Data 50 – ‘Companies Driving Innovation in 2017’. The world of data management is constantly changing. Evaluating new and disruptive technologies, as well as when and where they may prove useful, is the challenge. Against the rapidly evolving big data scene, this year, Big Data Quarterly presents the newest “Big Data 50,” an annual list of forward-thinking companies that are working to expand what’s possible in terms of collecting, storing, and deriving value from data. OAKLAND, Calif. — July 25, 2017 — Franz Inc., an early innovator in Artificial Intelligence (AI) and leading supplier of Semantic Graph Database technology for Knowledge Graphs, today announced Gruff v7.0, the industry’s leading Graph Visualization software for exploring and discovering connections within data. Gruff provides novice users and graph experts the ability to visually build queries and explore connections as they developed over time. The new time slider feature speeds discovery and enhances the ability to uncover hidden relationships within time based data. OAKLAND, Calif. — July 12, 2017 — Intel recently launched its new Intel® Xeon® Scalable processors, providing businesses with breakthrough performance to handle compute-hungry tasks including real-time analytics, virtualized infrastructure and high-performance computing. Their launch marks the greatest set of data center and network processor advancements in a decade. Montefiore Health System has deployed a data analytics platform running on these new Intel® Xeon® processors, a solution that analyzes varied and vast amounts of raw data in near-real time to help clinicians identify optimal treatment plans for patients. The solution provides a breadth of data management technologies including Franz AllegroGraph’s Semantic Data Lake, predictive analytics, machine learning, and more. AllegroGraph allows Montefiore to extract sophisticated decision insights and predictive analytics from highly complex, distributed data in a way that is not possible using conventional databases. These predictive analytics are making big data more meaningful. Franz CEO Dr. Jans Aasman, and Dr. Parsa Mirhaji, director of Clinical Research Informatics at Montefiore and the Albert Einstein College of Medicine joined Intel at their product launch event. OAKLAND, Calif. — June 19, 2017 — Franz Inc., an early innovator in Artificial Intelligence and leading supplier of Semantic Graph Database technology, today announced that it has been named to the Database Trends and Applications (DBTA)100 – ‘The Companies That Matter Most in Data’. The world of data management is constantly changing. The DBTA 100 recognizes vendors who are evolving with the times and leading the charge to address new opportunities and requirements. Embracing the old and new, well-established and cutting edge, this fifth annual DBTA 100 list spotlights the companies that are dealing with evolving market demands through innovation in software, services, and hardware. The list includes long-established IT companies and newer upstarts anxious to shake up the data management space. Each year, the DBTA 100 presents “View from the Top” articles by company executives explaining how their organizations are uniquely addressing the data challenges of today—and tomorrow. OAKLAND, Calif. — March 27, 2017 — Franz Inc., the leading supplier of Semantic Graph Database technology, today announced that its flagship product, AllegroGraph, has been named a ‘Champion’ by Bloor Research in its recent Graph Database Market Update report. AllegroGraph is a database technology that enables businesses to extract sophisticated decision insights and predictive analytics from highly complex, distributed data that cannot be uncovered with conventional databases. Unlike traditional databases or NoSQL databases, AllegroGraph employs semantic graph technologies that process data with contextual and conceptual intelligence. AllegroGraph is able run queries of unprecedented complexity to support predictive analytics that help organizations make more informed, real-time decisions. OAKLAND, Calif. — February 6, 2017 — Franz Inc.’s CEO, Dr. Jans Aasman, will present at the Enterprise Data World Conferencein Atlanta, GA Tuesday, April 4th, 3:45 PM. The 21st annual Enterprise Data World (EDW) Conference is recognized as the most comprehensive educational conference on data management in the world. Enabling the Data Lake for scalable and extensible analytics with the ultimate goal of developing a learning system is rapidly taking shape for the Enterprise. Until recently big data was focused on processing massive amounts of simple, flat data. But now, there is a requirement to fuse complex data to create more intelligent analytic frameworks to achieve better business decisions. Adding advanced analytics to a Data Lake to create a scalable knowledge-based analytics platform for pattern recognition, classification, predictive modeling, and simulations is rapidly developing with use cases in Fraud Detection, Healthcare, E-commerce, Intelligence, and more. OAKLAND, Calif. — February 1, 2017 — Franz Inc.’s CEO, Dr. Jans Aasman, will be presenting at the TTI/Vanguard Data Big and Small Conference in San Francisco, California – February 16-17. His presentation topic will be on Semantic Graph Databases and Analytics. Information about the conference can be found here. TTI/Vanguard is the advanced technology conference series for senior-level executives. We introduce, discuss, and evaluate emerging and breakthrough technologies on the two-to-five-year horizon. Through conferences, workshops, and field trips, experts offer perspectives on future technologies and their impact on organizations, infrastructures, policies, and society. The result is a framework for linking strategic technology planning to business success. OAKLAND, Calif. — January 11, 2017 — Franz Inc.’s CEO, Dr. Jans Aasman, will be presenting and providing a tutorial at the Smart Data Conference in Redwood City, California – January 30-31. The Smart Data Conference is designed to accommodate all levels of technical understanding. It will bring together emerging disciplines that are focused on more intelligent information gathering and analysis. Cognitive Computing Platforms are a growing phenomenon that have been shown to add significant value to the Enterprise. IBM’s Watson is just one of the more well known examples. The power of these platforms is that you not only base your enterprise decisions on what is in your structured enterprise data warehouse, but you also mine the unstructured data. In addition, the platform combines proprietary and public knowledge in the form of vocabularies, taxonomies, ontologies, and linked open data with a powerful layer of machine learning technologies. The resulting analytics are pushed back into the core knowledge corpus resulting in a learning system that continually tunes desired metrics. OAKLAND, Calif. — January 31, 2017 — Franz Inc., an early innovator in Artificial Intelligence (AI) and leading supplier of Semantic Graph Database technology and Lead Semantics, a Big Data Analytics start-up delivering cloud based Advanced Analytics and Data Science, today announced their partnership to deliver Smart-Data Integrated Data Science. Hiddime is a cloud based Business Intelligence (BI) and Analytics service. It is an easy to use Interactive Discovery and Exploratory Analytics tool (IDEA tool) for the frontline Business Managers and Domain Specialists, who are not necessarily IT experts. AllegroGraph underpins the business intelligence data warehouse and retrieval system. Hiddime with AllegroGraph as the semantic data backend enables easy yet exhaustive querying along with integration of data from external sources leading to faster realization of deeper analytics and insights. OAKLAND, Calif. — March 29, 2016 — Franz Inc.’s Vice President of Corporate Development, Dr. Sheng-Chuan Wu, will be a keynote speaker at the 14th Pacific Rim International Conference on Artificial Intelligence (PRICAI 2016) this August in Phuket, Thailand. The PRICAI is a biennial international event which concentrates on AI theories, technologies and their applications in the areas of social and economic importance for countries in the Pacific Rim. The Program Committee invites technical papers on substantial, original, and unpublished research in all aspects of Artificial Intelligence. PRICAI-2016 aims to bring together a large and diverse community, which includes practitioners, researchers, educators, and users. This event aims to bring together many scholars, researchers and managers of various areas and industries for intellectual exchanges, research cooperation and professional development. OAKLAND, Calif. — March 23, 2016 — Franz Inc., an early innovator in Artificial Intelligence and leading supplier of Semantic Graph Database technology, today announced that is has been named to KMWorld’s 2016 list of the ‘100 Companies That Matter in Knowledge Management’. Oakland, CA — March 10, 2015 — — Franz Inc. has been selected for the 2015 Best of Oakland Award in the Graph Database Technologies category by the Oakland Award Program. OAKLAND, Calif. — February 9, 2015 — Franz Inc., the leading supplier of Semantic Graph Database technology, today announced AllegroGraph 5.0 with unique multi-dimensional indexing capabilities. Data Scientists can think of these new multi-dimensional indices as similar to OLAP data cubes or HyperCubes but with the powerful dynamic data linking of a Graph Database. Oakland, CA — February 2, 2015 — UC-Berkeley will receive IEEE Milestone recognition for their RISC Project on Feb 12, 2015. The UC-Berkeley RISC milestone plaque will be unveiled at 3:30 PM in the lobby on the 3rd floor of Soda Hall, Berkeley’s Computer Science building. Speakers will include IEEE 2015 President Howard Michel, Professor David Patterson, and several others. Oakland, CA and McLean, VA — January 13, 2015 — Haystax Technology, Inc., and Franz Inc., announced a technology partnership that will enable Haystax to leverage Franz’s AllegroGraph technology for patented algorithms and sophisticated behavior models used in Haystax’s insider threat detection solutions. Haystax’s solutions, which are being rapidly adopted by the U.S. government and Fortune 500 companies, are more advanced than traditional rules-based and brute-force processing approaches in identifying the types of risks and the potential impact of their actions that individuals pose to an organization. Graph databases, like AllegroGraph, are one of the new technologies encouraging a rapid re-thinking of the analytics within the social media landscape. By tracking relationships – in a network of people, organizations, events and data – and applying reasoning (inference) to the data and connections, powerful new answers and insights are enabled. OAKLAND, Calif. — November 17, 2014 — Franz, Inc. and the U.S. Census Bureau announce the licensing of AllegroGraph. Graph databases, like AllegroGraph, are one of the new technologies encouraging a rapid re-thinking of the analytics landscape. By tracking relationships – in a network of people, organizations, events and data – and applying reasoning (inference) to the data and connections, powerful new answers and insights are enabled. OAKLAND, Calif. — November 3, 2014 — Franz Inc.’s CEO, Dr. Jans Aasman, will present at the Taxonomy Boot Camp Conference this November in Washington DC. Taxonomy Boot Camp brings together practitioners and experts in taxonomy, vendors who have created tools to help manage your taxonomies, and novices who are starting out in the world of information management. AllegroCache’s dynamic object database technology powers leading edge, mission-critical applications that are robust, extensible, and easy to evolve. OAKLAND, Calif. — October 14, 2014 — Franz Inc., the leading supplier of Graph Database technologies and Common Lisp based tools today announced AllegroCache 3.0, enhancing its object persistence capabilities for Allegro CL, the industry’s leading Common Lisp based development environment. “Demand for approaches to solve complexity is increasing with the “Big Data” onslaught. Modern Lisp developers now have the best tools to develop their applications and deliver products to market on-time and on-budget,” commented Dr. Jans Aasman, CEO of Franz Inc.
“AllegroCache is the heart of our rule-based Solicitation Selection system as well as our Medical Supply Chain solution for the U.S. Department of Defense.” noted Glenn House Sr., President 2Is Inc., “We are delighted with the new functionality in AllegroCache 3.0. We are able to cut our hosting database footprint by 50%, increase our transaction speeds from 50% to 100% and bring new search capabilities to bare.” stated Mr. House. OAKLAND, Calif. — July 1, 2014 — Franz, Inc. and The Malaysian State of Sabah’s Biodiversity Center (SaBC) announce the licensing of AllegroGraph to run the Sabah Biodiversity Integrated Information System (SaBIIS). NoSQL Now! Conference will feature Dr. Jans Aasman, CEO of Franz Inc.
OAKLAND, Calif. — May 15, 2014 — Franz Inc.’s CEO, Dr. Jans Aasman, will be a featured speaker at the 2014 NoQL Now! conference this August in San Jose, CA. The fourth annual NoSQL Now! Conference is the largest vendor-neutral forum focused on NoSQL (Not Only SQL) technologies. The conference is intended for every enterprise looking for better, faster and cheaper solutions to manage its growing databases and data stores. Data relationships play a vital role in various forms of data analytics, structured machine learning, and data mining applications. Data architects have begun to realize these relationships are more naturally expressed as “Graphs”. We discuss how Graph Databases for enhanced analytics have become an integral part of the Hadoop technology stack. OAKLAND, Calif. — April 14, 2014 — Franz Inc.’s Senior Engineer, Gábor Melis, will be a keynote speaker at the 7th annual European Lisp Symposium (ELS’14) this May in Paris, France. The European Lisp Symposium provides a forum for the discussion and dissemination of all aspects of design, implementationand application of any of the Lisp and Lisp-inspired dialects, including Common Lisp, Scheme, Emacs Lisp, AutoLisp, ISLISP, Dylan, Clojure, ACL2, ECMAScript, Racket, SKILL, Hop etc. We send probes into the topic hypercube bounded by machine learning, parallelism, software and contests, demonstrate existing and sketch future Lisp infrastructure, pin the future and foreign arrays down. Graph Database and Professional Services provider, Franz Inc., posted strong license growth for AllegroGraph, attributable to differentiated industry offerings and industry leading database capabilities. OAKLAND, Calif. — March 3, 2014 — Franz, Inc., a leading provider of Graph Search solutions based on its industry leading database software, AllegroGraph, posted strong growth for license sales of AllegroGraph in 2013. OAKLAND, Calif. — February 26, 2014 — Franz, Inc. and Tohoku Medical Megabank announce the licensing of AllegroGraph. Graph databases, like AllegroGraph, are one of the new technologies encouraging a rapid re-thinking of the analytics landscape. By tracking relationships – in a network of people, organizations, events and data – and applying reasoning (inference) to the data and connections, powerful new answers and insights are enabled. OAKLAND, Calif. — February 21, 2014 — Franz, Inc. and State Farm announce a training class covering AllegroGraph and related technologies. Graph databases, like AllegroGraph, are one of the new technologies encouraging a rapid re-thinking of the analytics landscape. By tracking relationships – in a network of people, organizations, events and data – and applying reasoning (inference) to the data and connections, powerful new answers and insights are enabled. OAKLAND, Calif. — February 12, 2014 — Franz, Inc. and WGSigma Systems jointly announce the availability of a Contract Risk Management framework for the large construction industry. With projects that can range from several hundred millions to multiple billions for a global project pipeline estimated at $9 trillion, budget and time overruns such as what happened at the Panama Canal expansion project ($5B) can create tremendous economic fallout ($1.6B in this case). The Sigma CRMS framework creates an early warning system that combs through critical project information including Daily Job logs, non-conforming reports, inspection reports, QC reports, contractor claims and notifications. All critical project information is then compared to the prevailing contracts to predict and advise project owners and prime contractors of risks and suggest what should be done given each partyҳ contractual rights and obligations, providing the workflow and evidence necessary to take action. With estimates for risk contingency near 20% of a construction project, the advantages offered by Sigma CRMS can go directly to the bottom line. OAKLAND, Calif. — February 3, 2014 — Franz Inc.’s CEO, Dr. Jans Aasman, will be presenting at the March Text Analytics World Conference in San Francisco. Text Analytics World is the full-spectrum conference that covers all aspects of text analytics. To solidify the business value you gain from text analytics, TAW delivers the latest methods/techniques, demonstrating their deployment across a wide range of industries large and small. TAW also explores the full range of vendor solutions and various forms of text analytics enterprise deployment. This leading event provides the means for people in fields traditionally separate and siloed to communicate and learn from one another – discovering how much they can gain from an interdisciplinary collaboration. OAKLAND, Calif. — November 1, 2013 — Franz, Inc. today announced that the company was named as one of 21 NoSQL Innovators to Look for in 2020, in a post on The Wikibon technology research and advisory website because of its flagship RDF and Graph Database product, AllegroGraph. “Thanks to the explosion of Big Data throughout every industry sector and requirements for real-time, predictive and other forms of now indispensable transactions and analytics to drive revenue and business outcomes, today there are more than 50 DBs in a variety of categories that address different aspects of the Big Data conundrum. Welcome to the new normal world of NoSQL – or, Not only Structured Query Language – a term used to designate databases which differ from classic relational databases in some way,” sites contributing author Gary MacFadden. OAKLAND, Calif. — October 20, 2013 — Franz, Inc., a leading supplier of Graph Database technology and Siemens Energy, the world’s leading supplier of a wide range of products, solutions and services in the field of energy technology, announced Siemens deployment of Unified Service Intelligence (USI) Answers, a natural language question answering system for semi-structured industry data that includes AllegroGraph as part of the technology. “Today’s enterprises need to make decisions based on analyzing massive and heterogeneous data sources”, said Dan Tecuci, Siemens Corporate Technology. “USI Answers is focused on offering easy and reliable natural language access to large bodies of data that are used in the planning and delivery of service by Siemens Energy”. Siemens deployed USI Answers for easy access to enterprise data to over 1500 users in 18 countries. The system allows users, even with limited familiarity with technical systems and databases, to pose questions in a natural way and gain insights of the underlying data sources available. OAKLAND, Calif. — September 16, 2013 — Franz Inc.’s CEO, Dr. Jans Aasman, will give the Keynote talk at ICSC 2013 on Wednesday, September 18 in Irvine, CA. The IEEE International Conference on Semantic Computing continues to foster the growth of a new research community. The conference builds on the success of the past ICSC conferences as an international forum for researchers and practitioners to present research that advances the state of the art and practice of Semantic Computing, as well as identifying emerging research topics and defining the future of the field. OAKLAND, Calif. — July 9, 2013 — Franz Inc.’s CEO, Dr. Jans Aasman, will present at the 2013 NoSQL Now! Conference this August in San Jose, CA. The third annual NoSQL Now! Conference is the largest vendor-neutral forum focused on NoSQL (Not Only SQL) technologies. The conference is intended for every enterprise looking for better, faster and cheaper solutions to manage its growing databases and data stores. OAKLAND, Calif. — May 15, 2013 — Franz, Inc. and The Malaysian Ministry of Science, Technology and Innovation (MOSTI)announce the licensing of AllegroGraph to run KRSTE.my. Graph databases, like AllegroGraph, are one of the new technologies encouraging a rapid re-thinking of the analytics landscape. By tracking relationships – in a network of people, organizations, events and data – and applying reasoning (inference) to the data and connections, powerful new answers and insights are enabled. “KRSTE.my is a one-stop access to all the information on Malaysian Research, Development & Commercialization activities in the areas of Science, Technology and Innovation (STI). Semantic Technology and RDF graph database make it possible to integrate the heterogeneous data from many disparate sources, to create such a one-stop information portal”, states Dr. Dickson Lukose, MOSTI’s Head of Knowledge Technology Cluster. Visit Krste.my at https://krste.my/. OAKLAND, Calif. — March 30, 2013 — Franz, Inc. and Wolters Kluwer announce the licensing of AllegroGraph. Graph databases, like AllegroGraph, are one of the new technologies encouraging a rapid re-thinking of the analytics landscape. By tracking relationships – in a network of people, organizations, events and data – and applying reasoning (inference) to the data and connections, powerful new answers and insights are enabled. OAKLAND, Calif. — March 12, 2013 — Franz Inc.’s CEO, Dr. Jans Aasman, will have two presentations at the June Semantic Technology Conference in San Francisco. The Semantic Technology & Business Conference (SemTechBiz) brings together today’s industry thought leaders and practitioners to explore the challenges and opportunities jointly impacting both corporate business leaders and technologists. Attendees benefit from this unique opportunity to explore how semantic solutions and linked data are being embraced throughout companies across a diverse range of business categories. OAKLAND, Calif. — February 4, 2013 — Franz Inc.’s CEO, Dr. Jans Aasman, will present at the Enterprise Data World Conference this April in San Diego, CA. Enterprise Data World (EDW) is the business world’s most comprehensive educational event about data and information management. Over five days, EDW presents a diverse schedule of programming that addresses every level of proficiency, including keynotes, workshops, tutorials, case studies, and discussions. EDW provides a superior learning opportunity for Senior IT Executives, Modelers, and Architects to meet and brainstorm with peers about changes in the industry, new products and projects, and learn about every facet of the data world at a single conference. OAKLAND, Calif. — January 30, 2013 — Franz Inc.’s CEO, Dr. Jans Aasman, will present at the Text Analytics World Conference this April in San Francisco, CA. Text Analytics World (TAW) covers all aspects of text analytics, delivering the latest methods/techniques, demonstrating their deployment across a wide range of industries large and small, and explores the full range of vendor solutions and various forms of text analytics enterprise deployment. TAW explores five major areas of text analytics: Big Data, Social Media, Enterprise Applications, Intelligence Applications, and Knowledge Organization. OAKLAND, Calif. — January 14, 2013 — Franz Inc.’s CEO, Dr. Jans Aasman, will present at the Conference on Semantics in Healthcare and Life Sciences (CSHALS 2013) this February in Cambridge/Boston, MA. CSHALS is the premier annual event focused on the use of semantic technologies in the pharmaceutical industry, including hospitals/healthcare institutions and academic research labs, with an expanded scope that includes the emerging field of data science. Topics covered by CSHALS 2013 span the continuum between standards development and big data workflows – the scope between Life Science data representation and its analysis. OAKLAND, Calif. — September 11, 2012 — Franz Inc.’s CEO, Dr. Jans Aasman, will present at the September Semantic Technology Conference in London. The Semantic Technology & Business Conference (SemTechBiz) brings together today’s industry thought leaders and practitioners to explore the challenges and opportunities jointly impacting both corporate business leaders and technologists. Attendees benefit from this unique opportunity to explore how semantic solutions and linked data are being embraced throughout companies across a diverse range of business categories. Having engaged several Fortune 500 companies with projects to develop Semantic Technology solutions, we have identified several consistent requirements that have become the foundation for successful deployments of Semantic Technologies. OAKLAND, Calif. — August 20, 2012 – Franz Inc., the leading supplier of Graph Database technology for the Semantic Web, today announced Gruff v4, the industry’s leading RDF browser to view graph data, explore connections within data, and visually build queries without writing code. In addition, Gruff allows users to easily visualize the RDFa embedded metadata on websites and combine with open or proprietary data to infer new facts. The free-form nature of Graph style data offers a lot of flexibility for constructing databases, but that freedom can also make it less obvious how to find arbitrary data for retrieval, error checking, or general browsing. Gruff is a graphical Resource Description Framework (RDF) database browser which makes data retrieval more pleasant and powerful by providing a variety of tools for laying out cyclical graphs, displaying tables of properties, managing queries, and building SPARQL and Prolog queries as visual diagrams. OAKLAND, Calif. — August 15, 2012 – Franz Inc.’s CEO, Dr. Jans Aasman, will be discussing graph database technologies and practical use cases during two presentations at the August NoSQL Now! Conference in San Jose. NoSQL Now! is a conference covering the dynamic field of NoSQL technologies (Not Only SQL). The goal of the educational conference is to describe the diversity of NoSQL technologies available to all organizations to address their business needs, and to offer objective evaluation processes to match the right NoSQL solutions with the right business challenge. OAKLAND, Calif. — August 13, 2012 – Franz Inc.’s Vice President of Corporate Development, Sheng-Chuan Wu will be discussing graph database technologies and practical use cases during the Keynote, and an additional presentation at the September Artificial Intelligence Special Sessions on Semantic Technology Applications in Kuching, Sarawak, Malaysia. The Artificial Intelligence Special Sessions (AISS 2012) is organized by MIMOS BERHAD and co-located with other events during the Knowledge Technology Week 2012 (KTW2012). Keynote Presentation: Mitigating Agriculture and Biodiversity conflicts with Semantic Technology – September 4th. Allegro CL’s dynamic object technology, now with SMP, powers leading edge, mission-critical applications that are robust, extensible, and easy to evolve. OAKLAND, Calif. — July 23, 2012 — Franz Inc., the leading supplier of Common Lisp based tools and Graph Database technology for the Semantic Web, today announced Allegro CL v9.0, bringing symmetric multi-processing capabilities to the industry’s leading Common Lisp based development environment. “Demand for faster, more intelligent, and scalable applications is increasing with the “Big Data” onslaught. Modern Lisp developers now have the best tool to scale their applications and deliver products to market on-time and on-budget,” commented Dr. Jans Aasman, CEO of Franz Inc.
OAKLAND, Calif. — June 11, 2012 — Franz, Inc., the leading supplier of Graph Database technology for the Semantic Web, today announced AllegroGraph 4.7, the industry’s first native RDF database with Enterprise Online Transaction Processing (OLTP) capabilities. This breakthrough in database technology allows companies to simultaneously add, query and dynamically reason over large scale semantic datasets with ACID compliance and transaction management. The v4.7 release adds Solr and MongoDB integration along with a host of other features and enhancements. OAKLAND, Calif. — May 15, 2012 — Franz Inc.’s CEO, Dr. Jans Aasman, will have three presentations as well as leading a panel discussion at the June Semantic Technology Conference in San Francisco. The Semantic Technology & Business Conference (SemTechBiz) brings together today’s industry thought leaders and practitioners to explore the challenges and opportunities jointly impacting both corporate business leaders and technologists. Attendees benefit from this unique opportunity to explore how semantic solutions and linked data are being embraced throughout companies across a diverse range of business categories. AllegroGraph is the first NoSQL database to achieve the loading of over 1 Trillion RDF Triples – A major step forward in scalability for the Semantic Web. OAKLAND, Calif. — August 16, 2011 — Franz Inc., a leading supplier of Graph Database technology, with critical support from Stillwater SuperComputing Inc. and Intel, today announced it has achieved its goal of being the first to load and query a NoSQL database with a trillion RDF statements. RDF (also known as triples or quads), the cornerstone of the Semantic Web, provides a more flexible way to represent data than relational database and is at the heart of the W3C push for the Semantic Web. A trillion RDF Statements eclipses the current state of the art for the Semantic Web data management but is a primary interest for companies like Amdocs that use triples to represent real-time knowledge about telecom customers. Per-customer, Amdocs uses about 4,000 triples, so a large telecom like China Mobile would easily need 2 trillion triples to have detailed knowledge about each single customer.